Every year I check the Warped Tour lineups, and every year it’s two bands I want to see and a bunch I either don’t or have never heard of. This year there was a whole bunch of stuff that looked interesting – Hatebreed, GWAR, Candiria, Sick of it All, Save Ferris, among others. 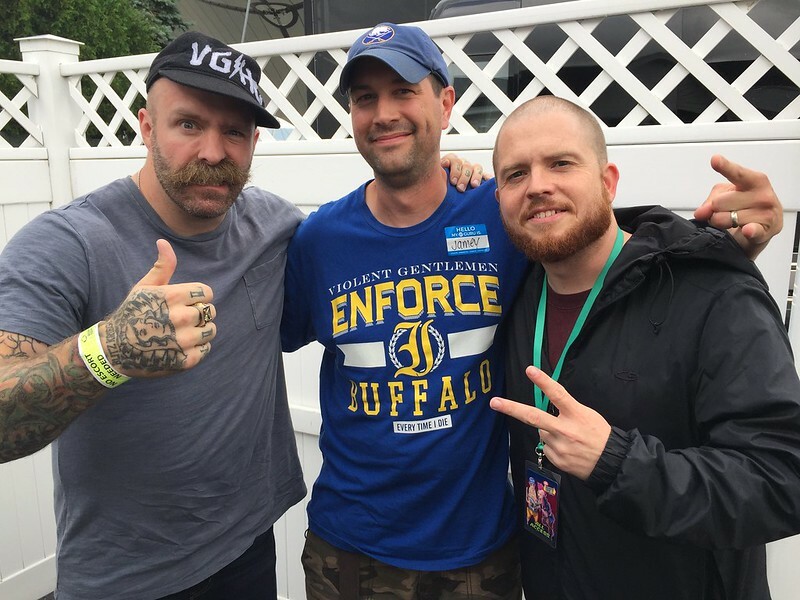 Plus Jamey Jasta was doing live podcast tapings at each stop, so that combined with the lineup pulled me out of Warped retirement. I hadn’t been to Warped since 1998 at LaSalle Park! Neither had Hatebreed for that matter, but they didn’t play Buffalo for some reason. I was curious to see how it compared nearly 20 years later. The weather almost didn’t cooperate. The morning of this show it was POURING. I ran around to practically every store in Batavia looking for a light windbreaker / raincoat before finally finding one at K- Mart. I rolled into Darien and miraculously the rain stopped pretty much as I arrived. Apparently they were shovelling water out from the front of the main stage right up until doors. I got in not too long after that, milled around a bit, and the first band I stopped to actually watch was Silent Planet. Pretty decent. Milled around some more, hit up the American Villian tent and talked to Jed for a second, and then caught some of After The Burial over on Mutant South because that was right near the tent for the workshops. Time to sit in on the Jasta show podcast taping! A bunch of the Warped artists had workshops that fans could buy tickets for, and Jamey’s was his podcast with fans sitting in. Given that this was the Buffalo show, the guest was Andy Williams from Every Time I Die. Given how hot and sticky it was outside, the fact that the taping was in one of the air-conditioned artist rooms backstage was much appreciated. The taping was fun, the podcast was entertaining as always, and pictures as proof are always in order! Most of everyone I wanted to see was later on in the day, save for a couple I would have liked to see that were playing during the podcast (Knocked Loose, I Prevail, Municipal Waste). I caught a little bit of Attila to see what all that fuss is about (I think I’m too old to get it), and a hockey player buddy of mine was touring with Separations, so I checked them out. I was interested to see Save Ferris, as I’d never seen them. Much like Hatebreed, they had played Warped in 1998 but they either didn’t play the Buffalo date or I didn’t see them. Either way, it was fun hearing the old songs, including, of course, Come On Eileen. Apparently its lead singer Monique Powell with a whole new band, but no matter to me. 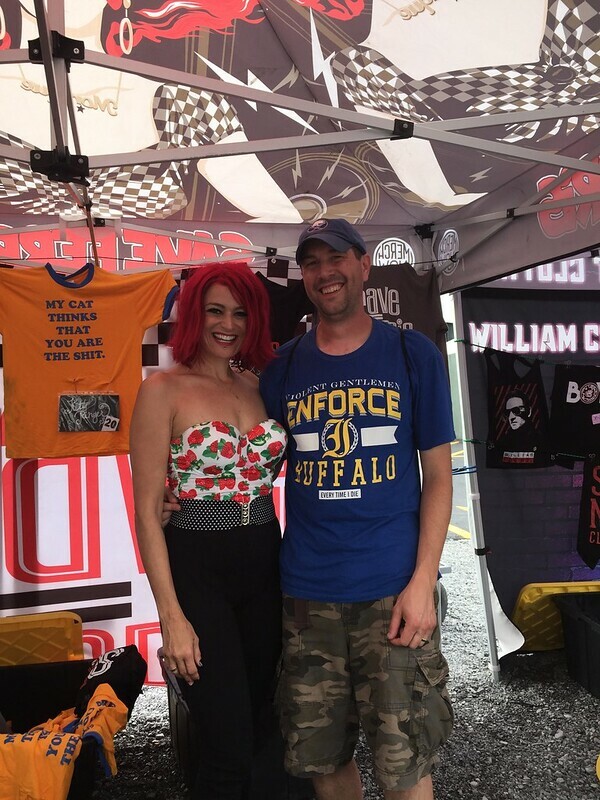 I picked up the new EP and got a pic with Monique at the merch tent too – I told her it was my first time at Warped since ’98 also! After Save Ferris, I caught little bits of CKY, a lot of Candiria (hadn’t seen them since Showplace in 2001! ), another buddy of mine has toured with Beartooth so I watched most of that set and was very impressed, a little bit of Emmure (same idea as Attila – I don’t get it), and then camped out in front of the Mutant North stage – watched the end of blessthefall, and all of The Acacia Strain on the other stage in preparation for my main attraction of the day – Hatebreed! They ran through a half-hour sprint of most of the hardest and crowd-participatory songs in the catalog, and boy was that fun. I was right up on the barrier and had a blast. It’s always a good time when Hatebreed comes to town. So after that I ran over to the main stage to catch the last song from Sick of it All, then came right back for GWAR. I don’t think most of the kids in attendance were ready for what they saw (or got sprayed with haha), however, they put on the usual hilarious spectacle. After GWAR I milled around a little more, ran into both Wayne and Florida Frank (Hatebreed’s guitar players) for a brief moment, and caught a couple more bands before calling it a night. I don’t know if the show sold out, but there were a good number of people there, and the kids seemed to be into it. Every single band looked like it had at least a bit of a dedicated following to go along with all the passerby (such as myself in most cases).